With a chic Euro-Mexi style, prime location, and the most premier resort amenities in all of Puerto Vallarta, the RIU Palace Pacifico has transformed the way guests enjoy the beautiful country of Mexico. What was once a cliché all-inclusive beach getaway now has morphed into something much more spectacular. From your first steps into the resort lobby, you feel like true royalty; the ceilings, walls, and floors are adorned with only the most opulent materials. Maybe it’s the high-rise ceiling, elegant chandeliers, charming marble pillars, or the majestic stain-glass centerpiece, but there’s an electricity when you enter the RIU Palace Puerto Vallarta. A sun soaked vacation to remember! Positioned on Flamingos Beach, just a short drive away from downtown Puerto Vallarta, guests get a unique combination of solitude and lively nightlife. The energy of the bustling city is there if you’d like it, but the RIU Palace Pacifico invites guests to enjoy the peace and quiet of this remote resort. We understand that some guests will prefer to dance the night away at the dic nightclub, while others will prefer to dig their noses into a good book and just soak up the rays. That’s why this resort’s location is one of the best in the entire country, for you have both peace and party at your fingertips. You won’t be located in the middle of a bustling resort town, but rather will be surrounded by large resorts, upscale homes, pristine beaches, and a perfectly maintained golf course. If you were looking for a little more tranquility during your next vacation, then this is one of the best locations you can choose. Though the RIU Palace Pacifico is away from all the action, it’s easy to catch a short cab into the downtown area of Puerto Vallarta and experience all the action the town has to offer. While you walk the property of RIU Palace Pacifico, you’ll soon be engulfed by the chic European vibe, mixed with the traditional Mexican authenticity. The property is rich with lively natural features, refreshing swimming pools, and several of the best food options in the country. Very similar to the RIU Palace Cabo San Lucas and RIU Palace Mexico, the RIU Palace Pacifico offers guests first class services to all of its guests at an affordable price. 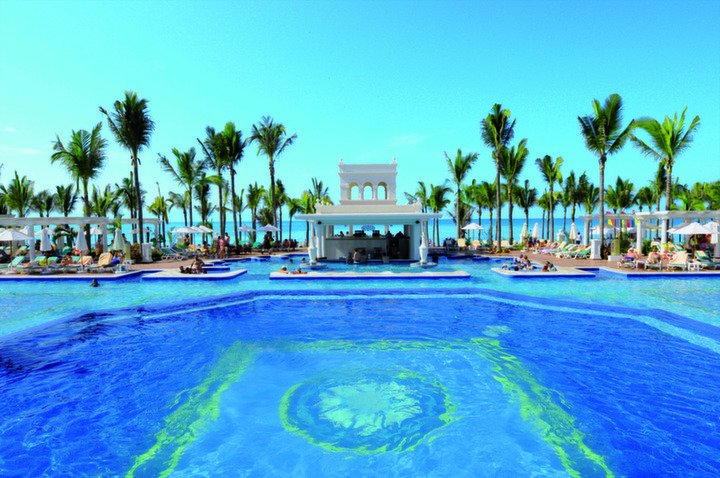 Just check out our RIU Palace Pacifico pictures and take an up close and personal look at what this resort has to offer! And no all-inclusive vacation would be complete without a pool lounge area. This resort has plush outdoor furniture, tiled walkways, incredible views of the water, and ample amounts of bars so you can order your favorite handcrafted cocktail, sit in the shaded Mexico warmth and gaze out in the ocean wondering why it took you so long to pamper yourself. This is a vacation you’ll be bragging about for years to come! If the chic design of this high class resort doesn’t grab your attention, then surely the seemingly endless array of food choices will. The RIU Palace Pacifico offers eight different culinary options, from buffets to gourmet candlelit dinners, the choices are endless. Wake up to an enormous breakfast at either buffet-style La Peninsula, or continental-style at La Toscana. Jump out of the pool and order a drink or snack at poolside Marlin Bar, or try a fancier option and enjoy a meal at Guacamole, Kyoto, Krystal, or Petit Pigalle, but the choice is all yours! Chefs use only fresh and local ingredients, allowing guests to enjoy some of the rarest ingredients and thus treating them to once in a lifetime type meals. 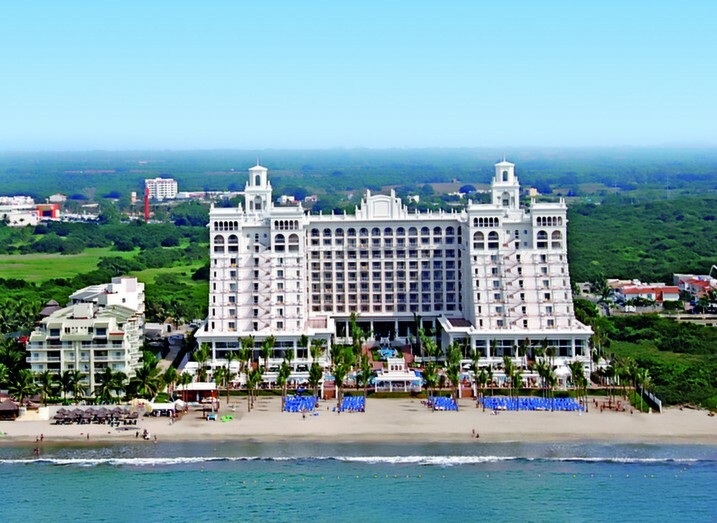 RIU Palace Pacifico group rates are very affordable when you book an all-inclusive vacation. What exactly is an all-inclusive vacation? It’s the entire experience of a luxurious beach getaway, but you won’t have to worry about paying for every meal and drink while you sit on the beach. Instead, you’ll design a vacation package that fits your budget and interests and then the rest of your vacation will be pre-paid. Leave that clunky wallet at home, because the watersports and resort amenities are included with your all-inclusive package payment. This allows you to enjoy your vacation without having to deal with dividing checks or tipping staff. 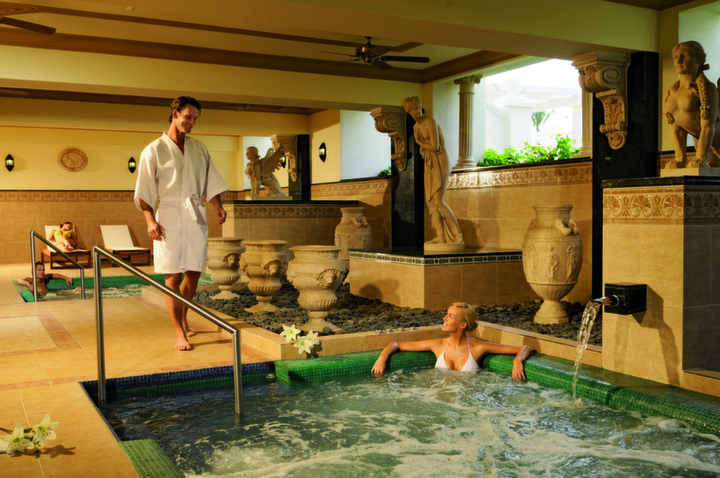 Start discovering what the RIU Palace Pacifico can do for you! 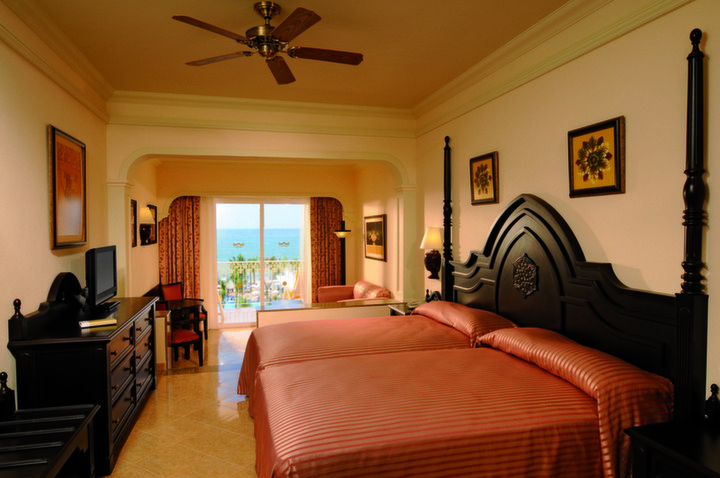 Rooms at RIU Palace Pacifico tend to be upscale, offering sensational views of the water from the comfort of their own private balconies. Guests can choose either a Junior Suite or Jacuzzi Junior Suite, which both have balcony views of the tranquil ocean, pool, or natural gardens. All rooms include comfortable beds (king or double double), luxury high thread count linens, small living rooms, stylish furniture, and high class design. In addition, you receive a flat-screen TV, mini-fridge, liquor dispensers, jetted shower and tub combo, patio furniture, and WiFi is also available at an additional cost. What more could you ask for? Get group rates today!